Vortex surprised me with the announcement of the new Fury HD Laser Rangefinding Binocular recently. Claiming to be two devices in one (high definition binocular + angle compensated rangefinder) it certainly got me excited. With optics that compare with the Viper HD range, you just know this will be a high performance bin. According to Vortex, this compacyt reflective targets will give accurate readings up to 1600 feet, while distance readings on large animals will be accurate up to 1200 feet in good conditions. The rangefinder controls are situated on the right hand side, making it easy to carry your rifle or bow in the other hand. How good is the rangefinding capability? 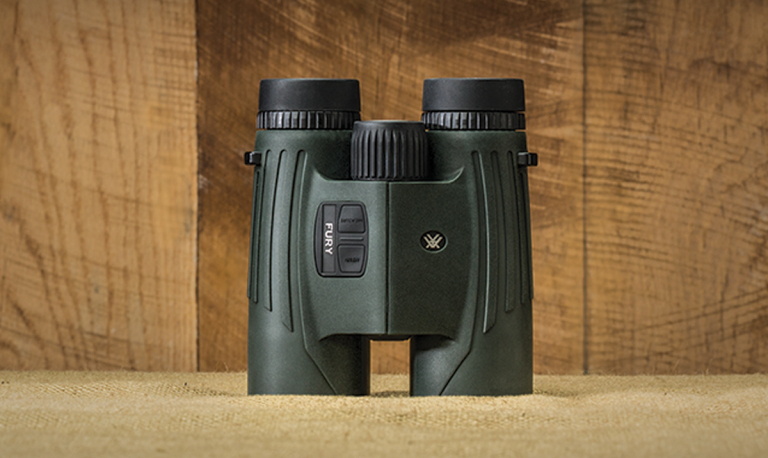 The 10×42 comes with a field of view of 314.4ft @ 1000 yards with a close focus of 20 feet. Weighing in at 31.8 ounces, it measures 5.75 in x 5.9 in. We will have to wait and see how good the built-in rangefinding really is, but from the distance ranges mentioned, it sounds like the Fury is going to be a beast. It also comes with a intuitive display with a simple-to-use menu (unlike so many other rangefinders), and the display is clean and easy to read. It features HCD (horizontal component distance) and LOS (line of sight) modes. HCD is for angle compensated ranging, while LOS will display the actual line of sight range to your target. A very handy scan mode will show continous ranges as you scan across an area or when you are tracking a moving animal. 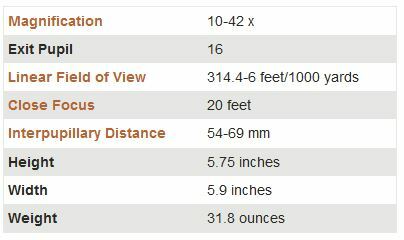 Ranges can be set to display in yards or meters. The Fury HD comes with standard Vortex VIP warranty, which is, in my opinion, one of the best warranties by any optic company. You can rest assured that if something goes wrong with your Fury HD, Vortex will repair or replace it at no cost to you. What makes this warranty ever better in this case, is that the Fury’s electronics are also fully covered. The Fury HD is not available in stores or online yet. The expected launch date is in the summer of 2017. As mentioned above the Fury HD Rangefinding Binocular is not available yet, but it will be on sale at the usual outlets, from Cabelas and Bass Pro Shops to any reputable outdoor store in your area. As in most cases, I would recommend checking out the Amazon pricing. I typically find Amazon offer good prices on optics and with the service levels and free delivery, they are my recommendation when buying the Fury HD. While pricing hasn’t been confirmed yet, I believe this rangefinder binocular will be in the $1599 price range. Let me know if you are as excited as I am about the upcoming launch of these bins.